Scalability Differentiation | Tennessee Aircraft Services, Inc.
Before the Industrial Revolution, the vast majority of products were produced one at a time by individual craftsmen or small groups of craftsmen. Eventually, the volume of consumption forced new production methods to keep up with demand. One of the concepts that drove the success of the Industrial Revolution was standardizing the production of small parts which also facilitated the move to a production line. If only one clock is to be built, it makes perfect sense for each part to be custom produced for a perfect fit with all the other custom made parts. As production rates increase, it becomes cost effective for each part to be constructed to a specific standard so that all fit together properly. When done well, parts made years later to the same spec will fit perfectly in the old clock when replacement parts are needed. The majority of clock parts are produced from solid and stable metals. Machining each part to exacting dimensions is fairly easy to accomplish. This advantage is just one of many that standardization and large scale production provides. Some products don’t make the transition to mass production very well. Small airplanes are generally constructed from thin skins, bulkheads, stringers and such, all fabricated from thin sheets of aluminum. These thin parts are secured to each other by smashing a small aluminum rivet in holes through the parts. That rivet smashing stretches and deforms the parts just a little. Of course, there are thousands of these little smashes working together to misshape everything. Small light aluminum planes also naturally twist and bend with every change in environment. That means the parts must be designed to take these variations into account. If you are skeptical about this, you should try opening and closing the cabin doors on a 210 the next time it’s on wing jacks. The change in shape of the cabin from being supported on its undercarriage to lifting from its wings can make it nearly impossible to close and latch the cabin door. The lightweight nature and large number of fasteners required for this construction adds many challenges to mass production. Each component has variations that must be accounted for when attached and fitted to larger assemblies. This adds huge labor costs to the aircraft build. Of more interest to us is how this translates to fitting spare parts that must be custom fit to an airframe that’s forty years old and has thousands of flight hours. One of the most noticeable products that eventually benefited from the new concepts developed during the Industrial Revolution is the automobile. The high volume demand for cars drives the ability to finance extensive automation. Standardizing every single part becomes a financially obvious decision, no matter how lightweight that part might be. One of the first auto manufacturers credited with more fully taking advantage of the efficiencies of mass production was Ford Motor Company. They produced about fifteen million of the iconic Model T between 1908 and 1927. According to the International Organization of Motor Vehicle Manufacturers, there were 3.9 M cars and 8.2 M commercial vehicles produced in the United States just in 2015. The aviation world doesn’t come anywhere close to these numbers. The Bureau of Transportation Statistics published the total number of aircraft currently registered in the United States is less than 220,000. Our industry counts annual production rates by the hundreds in good years. Even in the heyday of general aviation, the production of small plane models might make it into a few thousand. The term “million” isn’t even in our vocabulary. All of these factors explain why small planes have been and still are very much handmade. 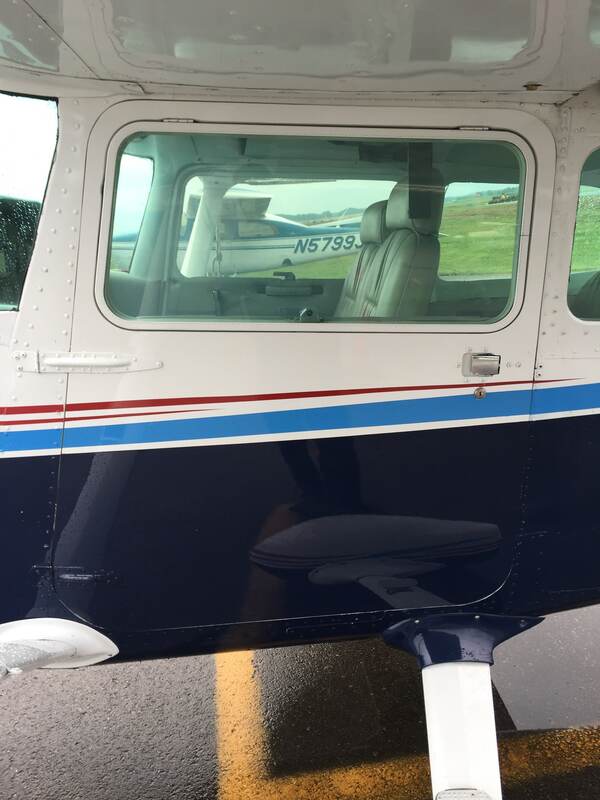 The necessary custom construction methods make it nearly impossible to move some parts from one forty year old Cessna to another forty year old Cessna. The most difficult are baggage doors, landing gear doors, cowlings and cabin doors. Sometimes however, you just have to try. A 1978 Cessna 172 cabin shares the same door opening structure as almost all the 172 series, including the “restart” planes that began production in 1996. The door latching mechanisms have changed and improved significantly over the years. The method of attaching the door structure to the outer skin has changed as well, but the door dimensions have remained mostly unchanged. The original door showing the bending at the trailing edge near the latch. Also note the holes punched near the center of the door from the strut step clamps. 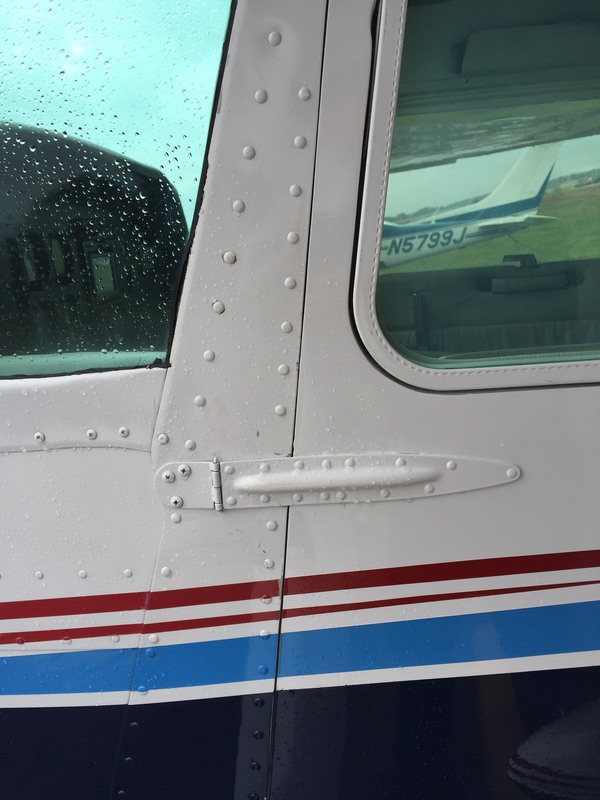 When the wind catches the pilot side door of a 172, the force has the ability to almost wrap it around the wing lift strut. There’s no realistic repair for a door in such a condition. A new door can cost upwards of $9K. The logical option is trying to fit a used serviceable door. 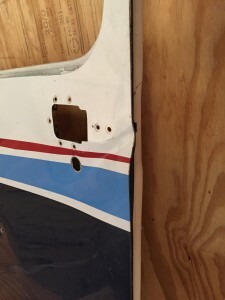 The original fitting process of the replacement door will determine how much effort and how well it will match the opening in the subject cabin. Getting the replacement door to fit well is a process of compromises. The door can be removed just by pulling the two hinge pins. However, this work requires removal of the six hinge mounting screws that go into the forward door post. The door post screw hole may well need to be slightly modified for good door placement. The upholstery should be removed from the old door and carefully set aside for later installation on the replacement door. The door lock also needs to be saved for later installation in the “new” door. The replacement door should have all its upholstery and seal material removed so everything can be carefully inspected. The door will be put in place and removed many times, so keeping it light is helpful. Removing the seal material allows the door to be put in place without fit interference and permits easier viewing of the door’s position in the frame instead of just looking at the edge of the exterior skin. If possible, it’s best for the door structure to fit evenly in the frame so the seal will compress as evenly as possible. To do this the fit must be viewed from the inside of the cabin. A few small pieces of modeling clay make a good spacing material to help locate the door. A second pair of hands to hold the door while taking measurements is very helpful. With the door structure centered in the cabin frame, the three primary points of interest are the position of the forward hinge bolt holes, the relative position of the door latch bolt to the ratcheting gear in the frame, and the spacing around the outside skin. The holes at the hinge mounts can be slightly elongated for some door positioning. The amount of elongation is limited by the available edge distance of the cabin structure at the fastener holes. Initially, the friction of the tightened hinge mounting hardware will hold the door in position. Eventually the weight of the door combined with the vibration and stress of operation will cause it to sag into some position other than planned. This slipping can be mitigated by adding a filler in the fastener holes to fill the small gaps. Most any filler with good compression qualities will work. Devcon or one of the Hysol structural adhesives will do well. The door latch bolt must properly engage the ratcheting gear mounted in the door frame. This is a hard locator and will determine the vertical position of the aft edge of the door. The latch can tolerate a good amount of fore and aft positioning. The appearance of the finished product is mostly determined by the gap seen around the edge of the door. In a perfect world this gap would be exactly the same all the way around the edge of the door. It should be wide enough so there’s no chance of the door catching on the cabin skins. About a sixteenth to an eighth of an inch seems to be the norm . Since the replacement door has already been cut to fit another plane, getting a nice fit around the perimeter isn’t likely. 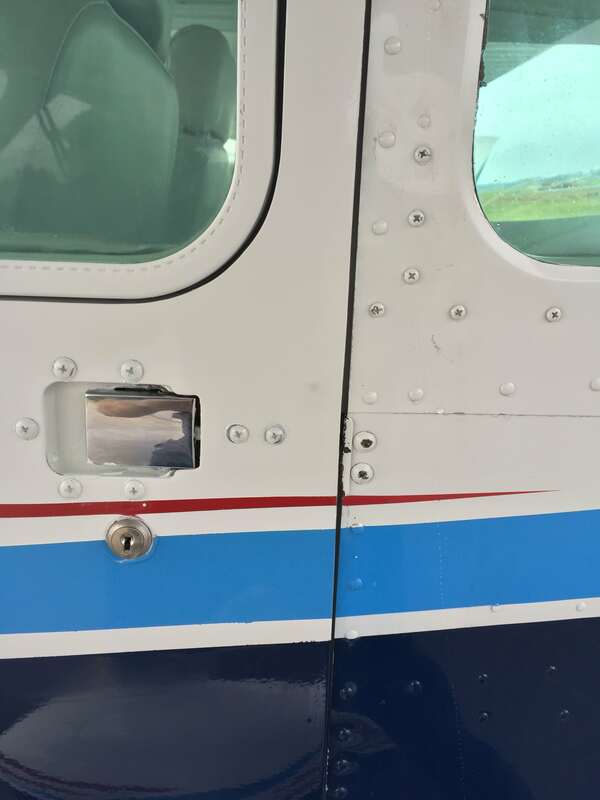 If the hinges are positioned as far as possible and the latch is set, then one might only be able to trim where the door skin touches the cabin. The size of the remaining gaps might just have to be accepted. After the best fit is achieved, the door is ready for painting. Stripping, priming and painting are best performed off the plane. It will need to be temporarily installed for taping of the stripes. The door must be in its proper final position when striping so all will line up later. It’s very disappointing and obvious when the finished door is offered up for service the final time only to discover the stripes don’t match. After painting, the door seal can be installed. This process is a topic all to itself. Generally, if the door is positioned well in the cabin frame, installation of the factory style seal in the original location around the door will result in an acceptable seal. If gaps exist that exceed the thickness of the factory seal material, then there are several aftermarket materials available that will do the job. When all is finished, the door should fit with a firm push, no slamming needed. From the inside the latch handle should require only light effort to rotate without binding or catching in the motion. After reinstallation of the upholstery and insulation, the door should have a nice sturdy sound when it closes. When the latch is rotated to release, the door should spring out about an inch or so. This is a good preload to ensure the door will open anytime it’s needed. 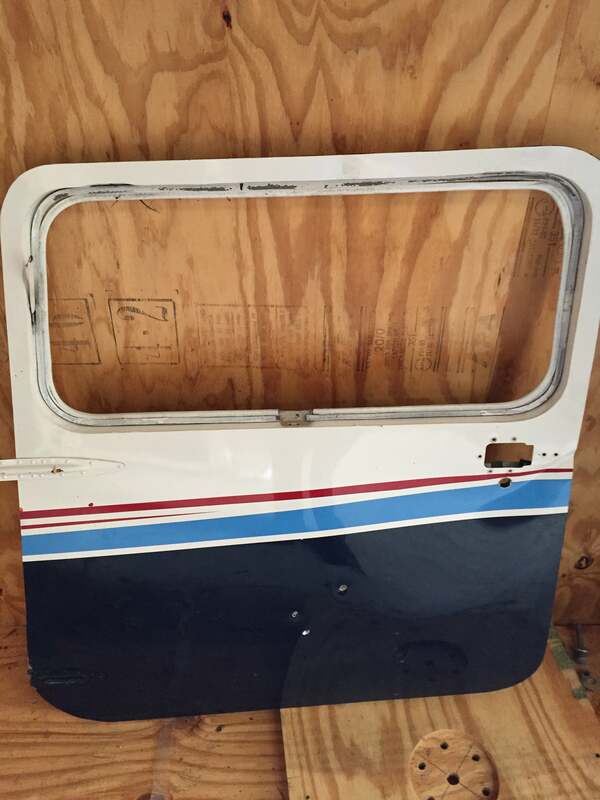 Purchasing a used door with no certainty that it’ll fit the airplane in a satisfactory way is risky business. The service manuals have no guidance for fitting a replacement door. Few mechanics have experience in such work. Most would avoid it because of the subjective nature of the fit. Even a door with a good initial fit requires significant effort to turn a nice fully finished appearance and operation. Patience and thoughtfulness are needed to get the best finish possible. A properly fitted and adjusted door is well worth the extra time and effort expended.